On Friday 5 October, Catherine, one of LKT’s Senior Translators, was delighted to attend a conference to celebrate the 40th anniversary of local partner Peak Translations. 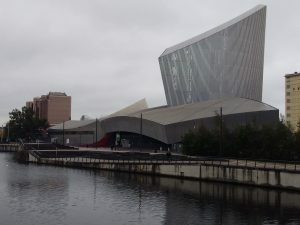 Hosted at the Imperial War Museum North in Manchester, the event was a chance for translators and interpreters from across the North West and beyond to meet in person, learn from fellow professionals and discuss the latest developments in the industry. The day was split into a number of seminars led by the Peak Translations team and several guest speakers, with topics including machine translation, multilingual SEO, subtitling and voiceover work. Each workshop provided fascinating insights into these specific types of translation work and emphasised just how important it is to keep abreast of the latest technological innovations so that translators are able to meet their clients’ requirements. There was also ample opportunity to discuss the current challenges facing the translation and interpreting industry and to suggest strategies to ensure that the sector carries on thriving. Following a full programme of workshops and a delicious lunch, the event was brought to close with a plenary session where attendees had the chance to ask any questions they had to a panel of experts including the Peak Translations team, the guest speakers and representatives from the Greater Manchester Chamber of Commerce and North West Translators’ Network. The conference certainly proved to be an excellent opportunity to share ideas, network and learn new skills. Thank you to the Peak Translations team for hosting such a brilliant event and congratulations once again on your milestone anniversary!